Having dispensed, at least for the time being with the majority of the useless deals, we shall waste no time exploring the meat of false dealing, and what I consider the most useful false deal in existence, the bottom deal. Along with the second deal, this is probably the most common, well-known, and well-used deal by far. When you understand the concept and its use, this is no surprise. Naturally, it involves dealing cards from the bottom of the deck, but how this is useful may not be immediately apparent to all, though my earlier mentions under the part of this volume on stacking should provide some indication. Essentially the issue is, the bottom of the deck is one of the most convenient locations to place cards, from here you can either palm or cop them off, as well as place them there via the same methods. Furthermore, on the bottom of the deck is very accessible during shuffles of all types, but perhaps most importantly, the bottom is rarely disturbed. It is this final point that renders the deal so well loved, since it essentially replaces stacking. 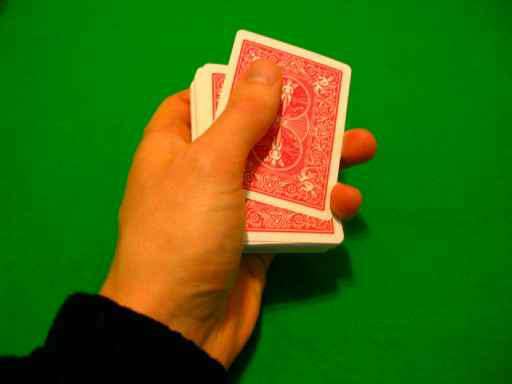 One can easily cull a hand or two to the bottom of the deck, then, rather than stacking, deal those hands off at will and as convenient. The bottom deal was the first deal I really attempted to learn, and I maintain that it is the easiest false deal to learn.. .at least initially. I've heard a lot of talk about how a bottom deal takes years to learn, as with any of these things, it isn't a matter of years, but a matter of time, practice and technique. If you practice for an hour per day, it will take you much longer than if you practice for five hours per day. If you practice simply throwing effort at a poor mechanic it will take you much longer than if you approach your study methodically, examining the weak points of the deal and working to correct them. Likewise, if you practice simply sitting at a table dealing you are not as likely to be effective as if you practice in front of a mirror or videotape yourself in order to identity how the deal looks from the perspective of an audience member. 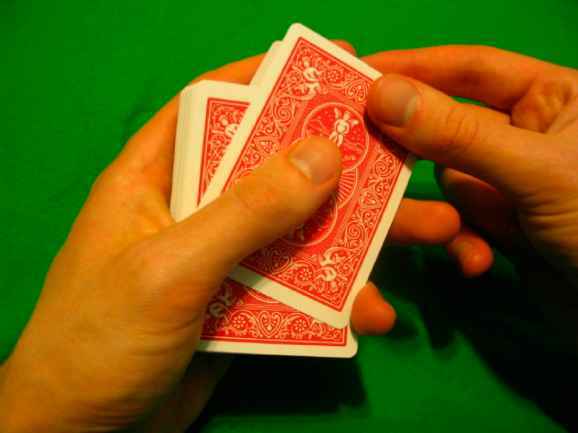 Finally, if you are practicing a very difficult or poor bottom deal it will take you considerably longer to master the move than if you practice an easy and well constructed handling. Ultimately, it is possible to gain a working bottom deal quite quickly and an effective bottom deal with perhaps a couple months of practice. I have no idea how long it took me as unlike learning the pass, I never kept track, I would suspect it was probably around a couple months of practice before I developed a tolerable bottom deal. While one may acquire a tolerable bottom deal relatively quickly and even an effective bottom deal within a reasonably short period of time, mastering all the subtleties and nuances takes considerably longer. Two that plagued me during the intermediate period of my study were finger flare and sound, though they may not have presented a problem for as long had I been aware of concerns to a greater extent at an earlier point. The sad reality is that often those who feel they possess an excellent bottom deal don't and most seem never to correct the problems perhaps in part because they are unaware of the various tip offs. In light of the fact that many card experts possess poor bottom deals, I suppose the misguided view that the deal takes years to master is not altogether surprising, though it strikes me as odd that many of these individuals have not refined their techniques. To some extent I feel magic is to blame. 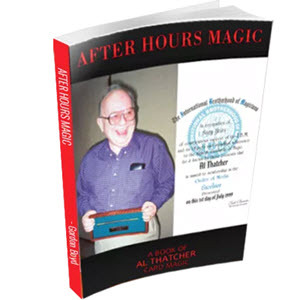 Often magicians study the bottom deal for presentations and get away with heinous handling merely due to the ignorance of the audience, who, I can tell you from experience, are easily deceived. This results in overconfidence on the part of the performer and an over-estimation of his or her skills. Hopefully, the information I provide here will give you the insights necessary to avoid such pitfalls, and to those who are experienced, offer some finer points on refinement. Finally, I must caution you as usual, that I have received no instruction in dealing bottoms; the techniques explored are my own in the sense that they are the result of practice, experimentation, and modification, both due to reflection and in some rare cases, performance videos. There is one exception to this case, I watched the Marlo videos "The Cardician" and "The Legend", in which Marlo teaches the cigar bottom deal. While, I had at this point examined numerous methods on my own, I did benefit from both his performance and his instruction, both offered ideas and inspiration on handling outlined herein. I also read "Drawing Room Deceptions" by Guy Hollingworth fairly recently. Though it came too late in most regards to alter my study, Mr. Hollingworth has a brilliant take on the push-off bottom deal that I will mention further later. I do owe a debt of gratitude both to those whose performances I witnessed, those who explored the topic with me by providing inspiration and to those who offered me criticism on my performance and handling. I cannot claim credit for the handlings derived in this section, nor do I lay claim to the methods, which certainly date back much further than myself, in those cases where my descriptions are inferior to the originals, whatever those may be, I humbly apologize. And now, having heard enough of my ranting, I'm certain, you wish to proceed. I'm not going to teach every possible bottom deal, for one, because I don't know them all and second, because I don't feel it's necessary. Rather, I will attempt to cover the main concepts and ideas I feel are relevant. Ultimately, each person has to find a deal that works well for them. Most of the time, when I'm bottom dealing, I use a strike bottom and it is partly for this reason that I am teaching the strike bottoms first. I consider the strike bottom deal considerably easier than the push-off bottom, particularly to perform well, but it is far from perfect in most cases. One of the main advantages in my opinion is the ability to shift easily from tops to bottoms as, at least the way I teach it, the strike bottom is virtually identical mechanically to the top. While the push-off bottom is naturally designed to appear identical to the top, the mechanics differ somewhat significantly. This is the first method I ever used to bottom deal, along with a few minor refinements; it is based off the handling of strike seconds method two, albeit originally I used a slightly different take. As usual, I invite you to review the original description of the grip and take outlined earlier, but given the importance of the bottom deal, I'll provide somewhat of a review. The deck sits in the left hand in a rough mechanics grip, but one that appears much like an Erdnase grip (if my description of the Erdnase grip is accurate). 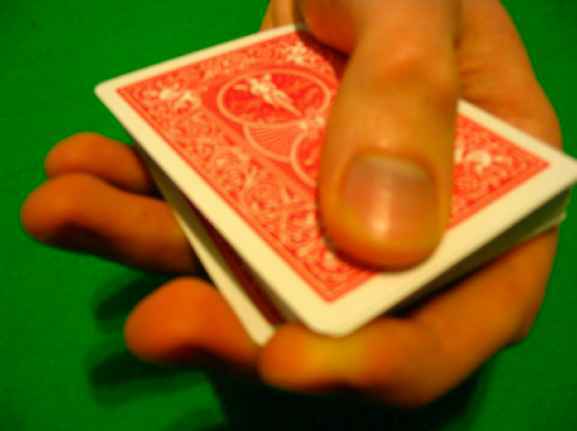 The pressure holding the deck in place occurs between the pinky and the base of the thumb, allowing free movement of all the fingers with the exception of the pinky. Now, I should caution you, that I will alter this grip slightly from the original second deal grip and if you intend to deal both seconds and bottoms from this grip you will have to reconcile the two. Thoughts on how to do so depend largely on what route you chose in solving the primary problem with bottom dealing from this grip. 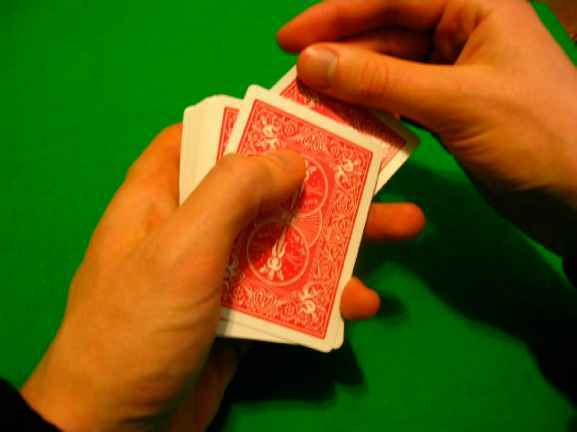 When I practiced at high speeds, I began to notice something, because of the nature of the deal, the card would pull my left middle finger upwards on the deck slightly and that it wouldn't return to its original position. 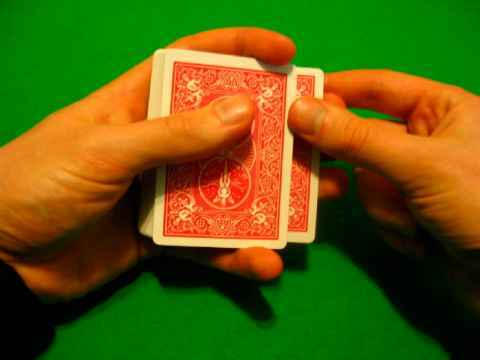 Essentially, the grip would shift ever so slightly from the initial mechanic's grip after the first bottom deal. I then decided that perhaps I should simply begin with this shifted grip (the name I've given it). So what you have now is a grip much like the Erdnase grip in appearance, but also resembling the mechanic's grip. 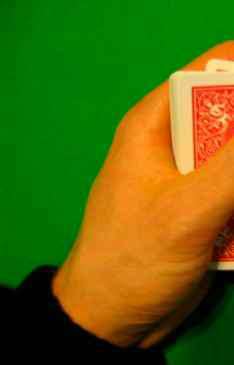 Your pinky holds the deck secure, the ring finger is slightly loose, but not completely open (this controls the angle of the cards) with the middle finger running along the top ending around the upper right corner and the forefinger above and slightly behind it. Now, there are various points to consider. First of all, ensure when you perform the take that you do so on the level. If you perform a slightly downward take the bottoms will behave differently than the tops since they lack the resistance of the deck. Second, be careful when it comes to sound, due to the finger positions some people encounter problems where they drag the bottoms against the fingers differently than they drag the tops. This problem is solved partially by the level take, but there are some other relevant points I'll mention later. 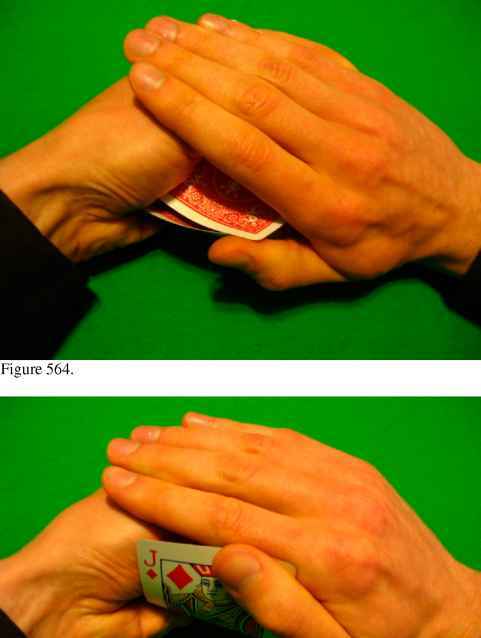 Third, it is often difficult to ensure the thumb position is the same on bottoms as it is on tops, practice getting them exactly the same and refer to the top thumb position, also ensure that the middle finger pinches the card in the same location when dealing tops as bottoms. 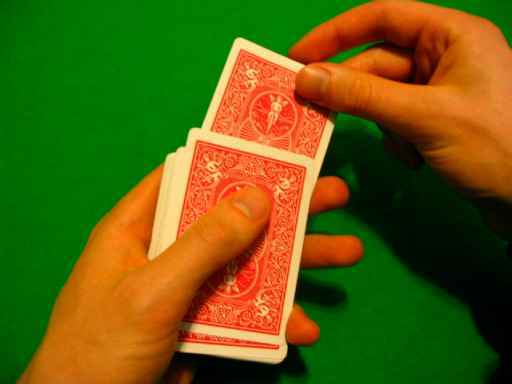 In order to smooth any discrepancies, make the deals quick and table the cards almost immediately rather than pausing with a card between your fingers. Hopefully, those give you some ideas you could employ when working on the bottom deal that is ideal for you. I'll likely not cover many of these subtleties or concept again in the future bottom deals, but I'm confident you'll easily figure out how to adapt them for other circumstances. 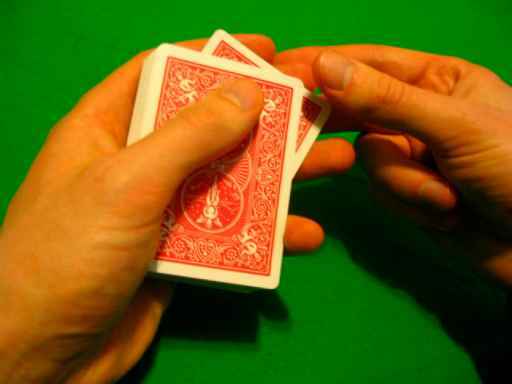 This variation is based on the cigar bottom deal as presented by Ed Marlo on the Cardician video and refers to the handling taught previously in strike seconds method two variation one. (Note a correction to this later on in the book; Marlo was actually using a master's grip). The grip is a mechanic's grip, the forefinger is loose, and the pressure you exert is mostly between the pinky and the base of the thumb though the ring finger and middle finger arguably assist. I must admit, I had not for some odd reason, considered performing the take between the left middle finger and forefinger, prior to seeing Marlo perform.. .disgraceful I know and a terrible oversight on my part. Be that as it may, I played around with the concept and quickly discovered that it was quite effective. With this particular deal, you have the advantage of only one finger in the way instead of two, but still the problems relevant to that finger. Naturally, you may approach the issue via one of the three methods described earlier, but there is another odd method I wish to suggest, and one that is extremely deceptive due to an optical illusion it creates. 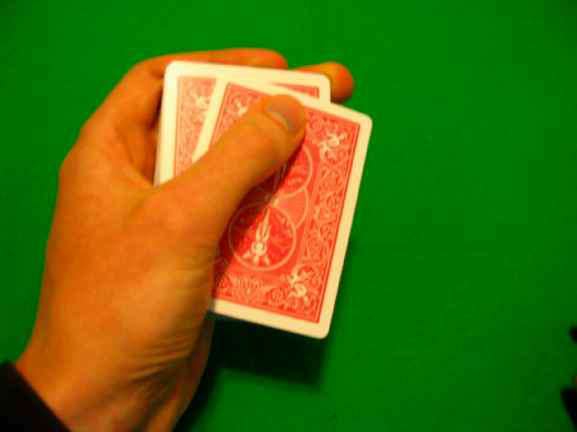 At this point, if you're dealing a top or a second, the thumb strikes as usual in a sweeping downward motion as you release the deck with your middle finger. 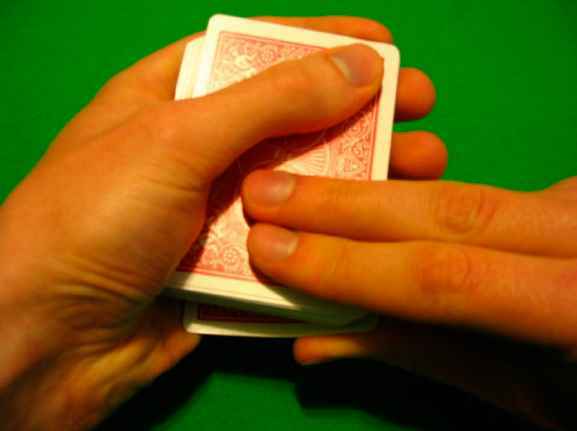 If you're dealing a bottom, the thumb also sweeps downward in an apparent striking action, but instead the middle finger takes the bottom card which is pinched between the middle finger and thumb as usual. 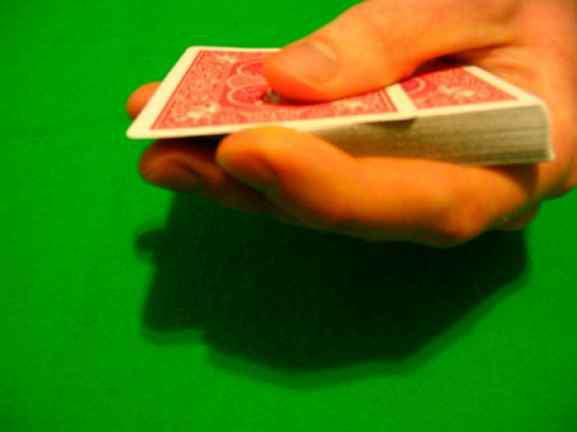 It is critical that you strike the upper right corner of the deck regardless of whether you're performing a bottom or not as it creates a superb illusion, the only difference is whether the thumb performs a take or not. I find this mechanic works very well for seconds as well as bottoms and thus refer to it frequently. 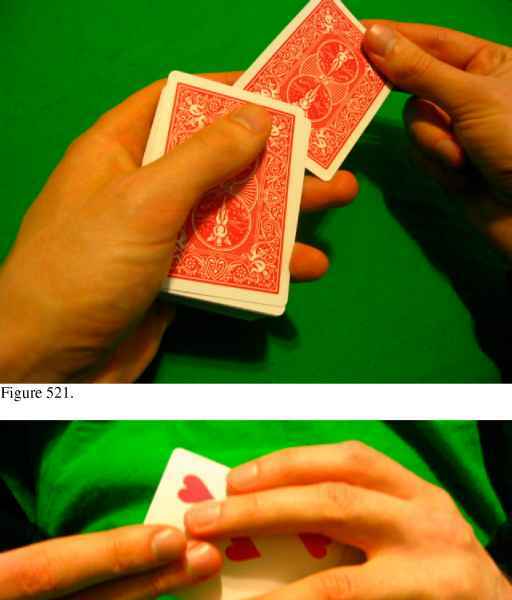 The premise is that as you lift the front of the deck the top card slides back slightly (no significant thumb movement) and as the deck falls back down the top card returns to its initial position (again, no significant thumb movement). This method is based on the now very familiar grip found in push-off seconds method one variation two and strike seconds method one variation two. 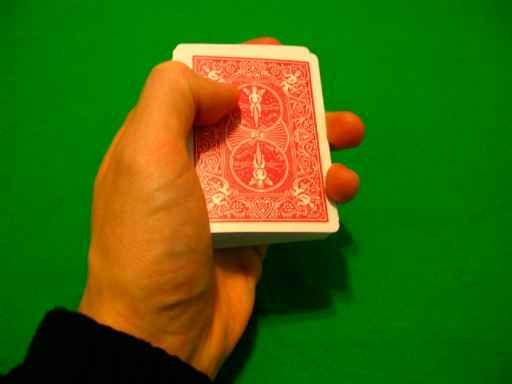 The deck is held between the forefinger in the upper right corner of the deck and the base of the thumb. You may refer to these earlier descriptions in order to obtain some understanding of how the deal is to proceed. This particular grip is quite difficult and unstable I find. I mentioned under strike seconds method one variation two that your last three fingers are somewhat open and this is by necessity since you will perform a mostly sideways take. However, I also mentioned that the gap is between you middle finger and ring finger. While this is both feasible and potentially effective, you could also lower your middle finger and perform the take closer to the upper corner of the deck below the forefinger. 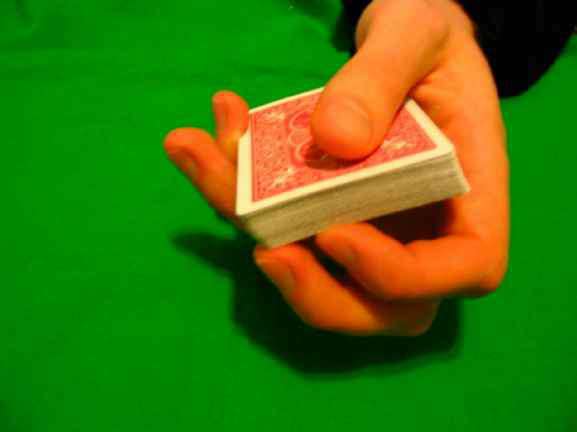 Now, as you perform the take, your middle finger moves under the deck between the middle finger and ring finger, where it strikes the card and takes it out in a sideways action to the right. There is a certain grace required here in order to ensure you take only one card and the that card comes easily. 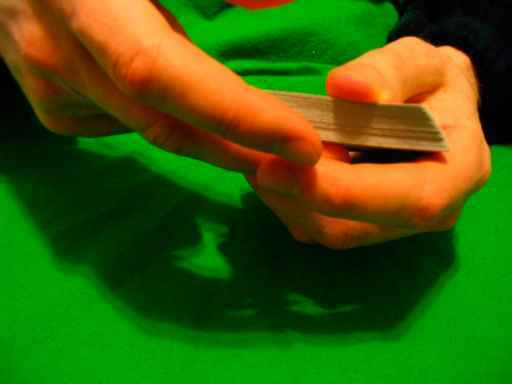 You should watch when you perform the take of the bottom card that the upper left corner doesn't protrude past the edge of the deck as often occurs if the card becomes skewered. 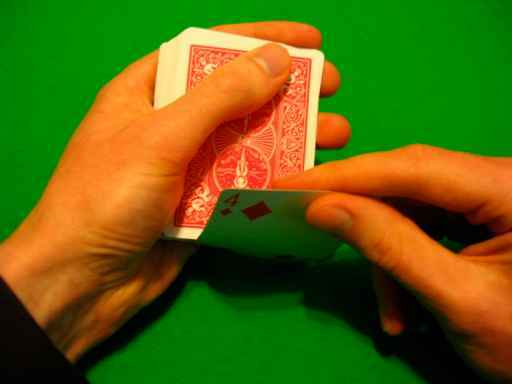 If the card twists, ensure it does so in a manner that avoids this pitfall. (See figure 533 for correct handling and figure 534 for an example of this potential tip-off). Unfortunately, due to the inconvenient position of the fingers, trying to ensure consistency of finger placement during the take is difficult when performing bottoms and will require some practice, but is ultimately fairly important. Again, dealing the card to the table quickly will reduce the chances of detection, but is not a method on which you should rely. 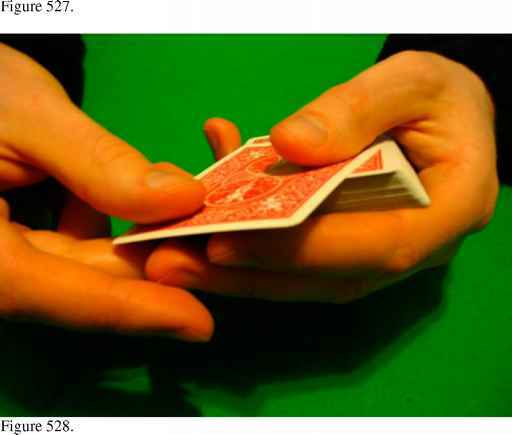 In order to help performing a smooth and clean take I find pulling the card slightly forward (away from you) as you pull sideways helps in freeing the card as well as ensuring the troublesome corner doesn't flash. Fortunately, in this case there are no fingers in the way, unfortunately, there is a distinct lack of control and so I tend not to make use of this deal. We now turn to the much more effective Erdnase grip, or at least my take on the grip if my description itself isn't entirely accurate. If you missed out or need to refresh yourself, earlier descriptions exist push-off seconds method one variation three and strike seconds method one variation three. The grip pressure is between the middle finger in the upper right corner and the base of the thumb in the lower left corner. 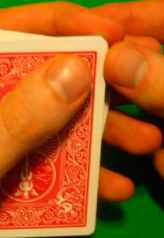 The pinky and ring finger extend almost fully with a gap between each of them while the forefinger runs along the upper edge of the deck above the middle finger. While not the simplest, the process is quite self-explanatory I think and given earlier pointers you should pick it up fairly quickly. This brings us to the not often used straddle grip as described in push-off seconds method two variation three and strike seconds method three. Again, my description of the grip is probably somewhat off from the original, as I have never studied a particular source on the subject, but this is the method as I've employed it. This is actually a really easy grip to perform fairly decent bottom deals from as it is secure, though I personally favor method one. I find this is often preferably if you want to slow your deal down and if you are either not performing seconds from this grip, or if you are performing the appropriate push-off seconds from this grip. Naturally, you'll need to experiment somewhat and determine which possibility works best for you. This idea is based on the Marlo cigar bottom deal. 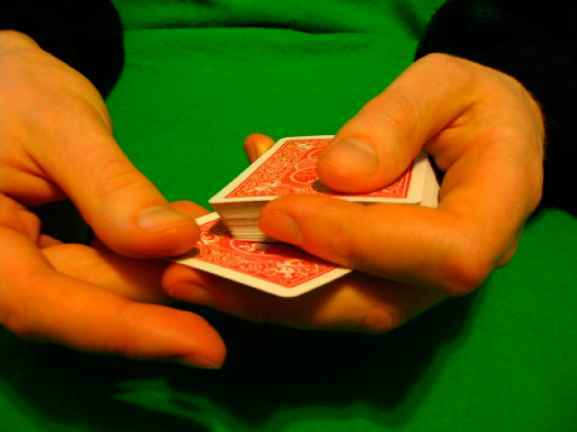 Basically, the way Marlo was performing his take was somewhat inconsistent, reaching further when he performed a bottom deal than when he performed his tops and consequently his wrist would turn when he performed the bottom deal. He noticed this while practicing dealing with a cigar in his hand because the cigar kept hitting the surface of the table. He then determined that if he performed the take with his ring finger rather than his middle finger no such inconsistency would be apparent. You can listen to Marlo tell the story himself on the "Cardician" DVD. The idea of this variation is then simply to use your ring finger instead of your middle finger to perform the take. This actually works quite well once you have it figured out and I use this handling often, but particularly for method one variation one, which effectively becomes Marlo's cigar bottom deal when performed with a ring finger take. The disadvantage of the ring finger take is of course that you effectively lose the use of the forefinger on other deals from the same grip and thus potentially restrict your dealing capabilities. Again, you are free to play around with each grip, each deal and each variation to determine what works best for you. The inquisition now progresses to a considerably more difficult and complicated bottom deal, the push-off. There are a number of concerns that arise inherently in regard to this deal, but also a number of advantages, most often, a clean take, the ability to perform Greeks deals, the potential to perform one handed deals and often better economy of motion. Unfortunately, the risk of knuckle flash becomes an almost insurmountable obstacle and one of the main forces keeping me from performing push-off bottoms regularly. 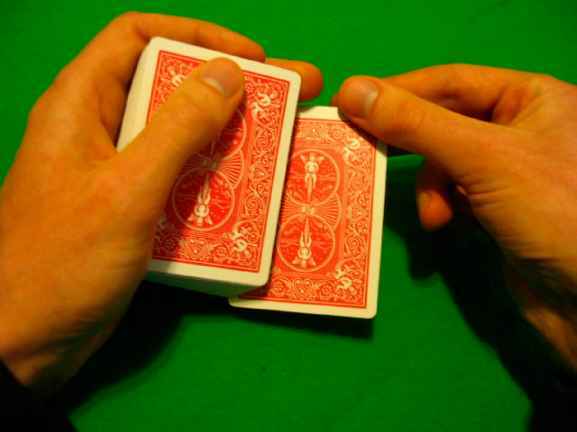 The general concept is, rather than going to the bottom cards with your right hand, you use your left hand fingers to push the card out along with the top card. While in the case of a strike bottom a push-off top is optional, I will say that in the case of a push-off bottom, a push-off top is mandatory. While I once practiced performing push-off bottoms fast enough that even without the push-off top it was deceptive, it isn't a practice I would recommend at all. 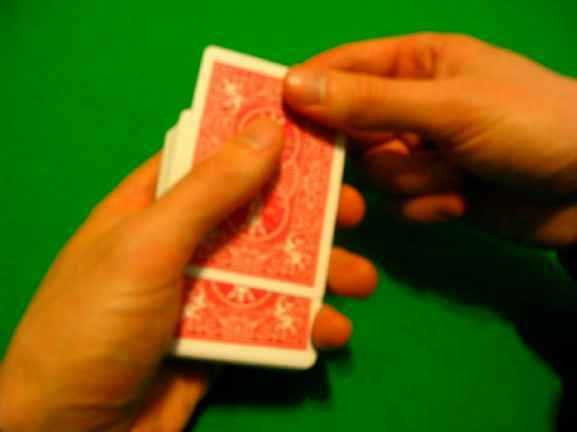 Thus, while I may not always refer to it explicitly, in each case where I describe a push-off deal, it is assumed that I am pushing off the top card in the same manner (angle) as the bottom card. 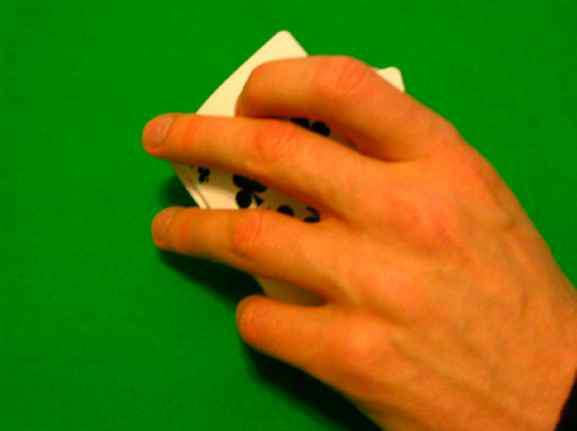 Note that both fingers are somewhat curled and the tip of the middle finger is on the upper right hand corner of the bottom card around the position of the pip. 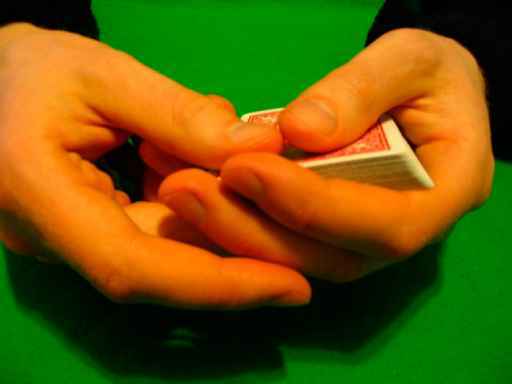 This angle of the hand is important because it will help offer better cover later when you perform the bottom deal. 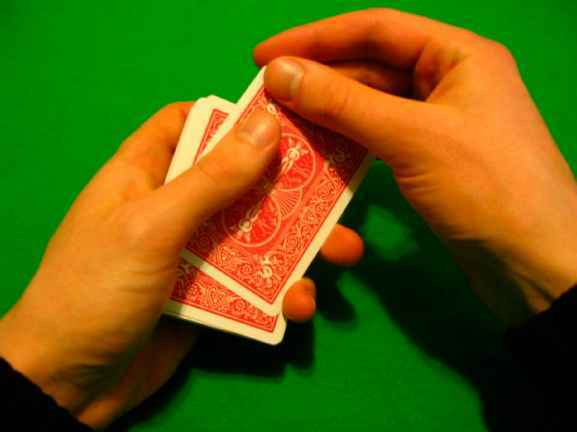 Unfortunately, due to the angle of the top card it is more difficult to pull back than many pull backs as it tends to catch in the crotch of your thumb. In order to avoid this, I recommend you perform the pull back in a pivot manner around the pinky and ring finger. This will probably take a fair amount of practice, but is worthwhile in order to obtain a good deal. You may also wish to consider pulling back your hand during this portion of the deal to cover the pullback with a larger motion. Really, although this was the first push-off deal I learned I don't recommend it at all. It is awkward and doesn't lend itself well to second dealing from the same grip. Nevertheless, it will hopefully give you some ideas for push-off bottom dealing. As an alternative, you can use your forefinger to perform the push-off, but again, I don't recommend this as it makes the knuckle flash very obvious. 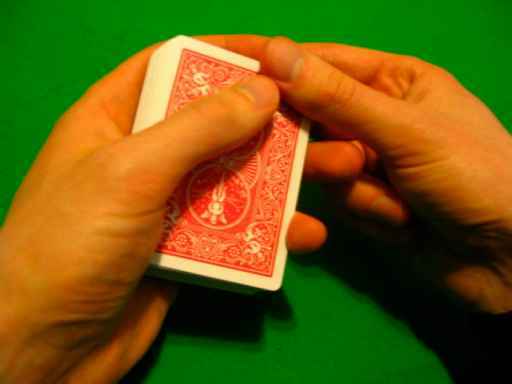 By now you are probably intimately familiar with the grip taught in push-off seconds method one variation two, method two variation one, strike seconds method one variation two and strike bottoms method two, where the deck is held between the forefinger in the upper right corner and the base of the thumb in the lower left. This is a borderline master's grip really, with perhaps the deck slightly higher in the hand and you are of course free to lower it if that is more comfortable for you. Now the key in this case revolves almost entirely around the last three fingers of your left hand. (For the sake of demonstrations I'm going to focus on the side push-off at this point and cover the angle push-off in a moment.) 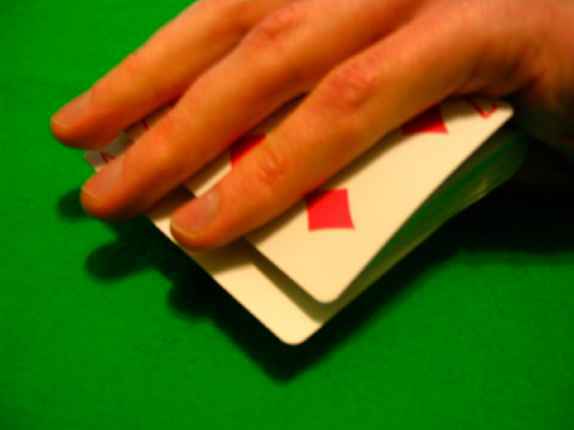 These last three fingers should be positioned in such a manner that the first joint from the tips of the fingers is along the bottom edge of the deck, while the tips extend upwards just above the top edge of the deck. You should have a gap between your middle finger and ring finger large enough to insert your right middle finger into it. Now, I found it is impossible to eliminate knuckle flash with this grip, but that's ok because we can minimize it and combine some misdirection in order to make this one of the most deceptive deals going and one I quite like. Then you'll perform the take and bring the fingers back to their regular position. This action will mirror perfectly, the push off action you're going to perform later and thus eliminate suspicion of the action. 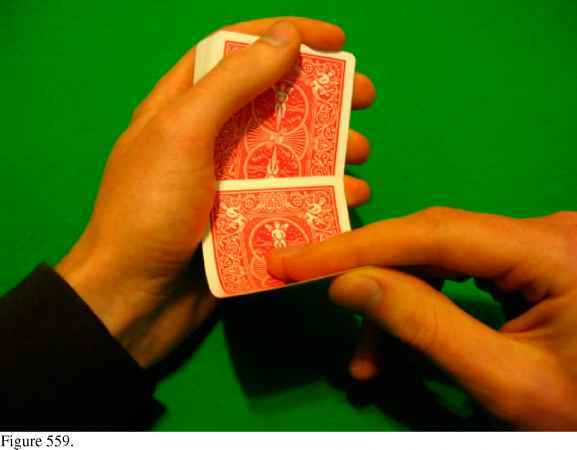 You must be careful not to push the bottom card out too far, you want it out just far enough that the edge of the card is covered from the front by the tip of your left forefinger. 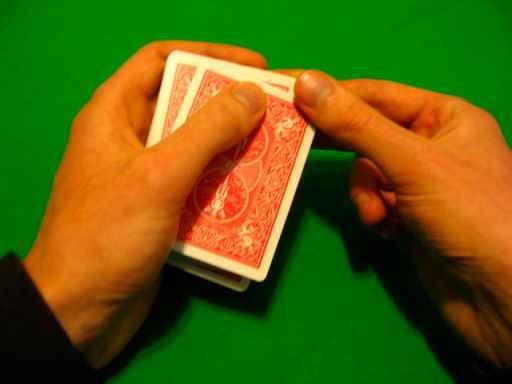 The cover offered by the left forefinger will also help later with the pull back of the top card. 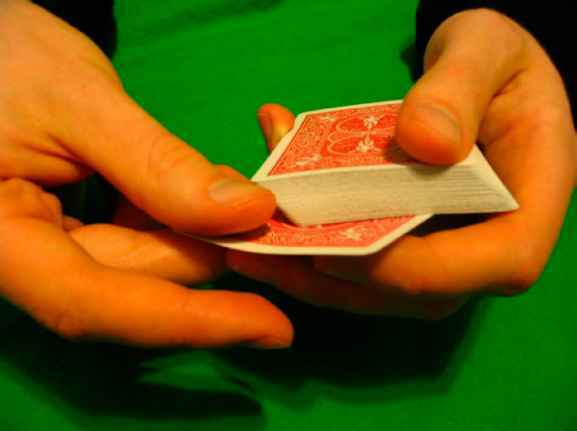 You also want to be careful that, when you're pushing out the bottom card you do so in a manner than none of the card protrudes beyond the front edge of the deck. 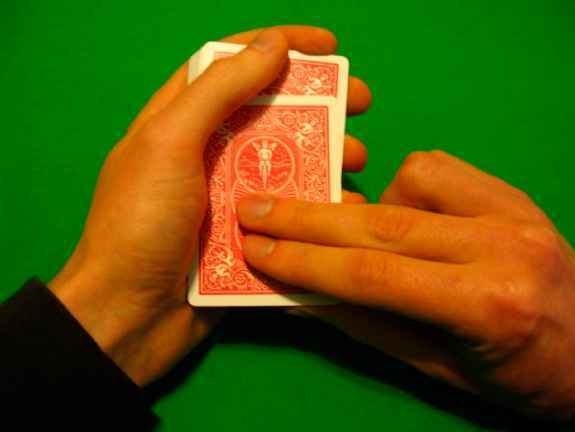 It tends to do so if you apply too much pressure with your middle finger high on the card and not enough with the other fingers low on the card. I cannot stress to you how beautiful this illusion is. I can perform this action extremely slowly and leave a very powerful impression that I did in fact real the top card from the deck. This is partially due to the fact that the left forefinger and angle of the hand cover the pull back beautifully, but also because the take is so graceful. 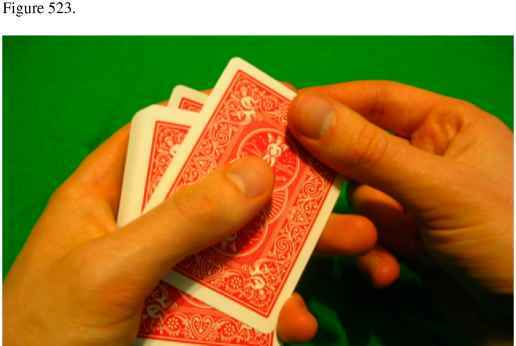 Also, perhaps most curiously, the left middle finger, ring finger and pinky, act as a sort of ramp for the bottom card, eliminating much of the distance between the top card and bottom card (be sure you don't let them rub together) creating a much stronger illusion such as that of a second deal. 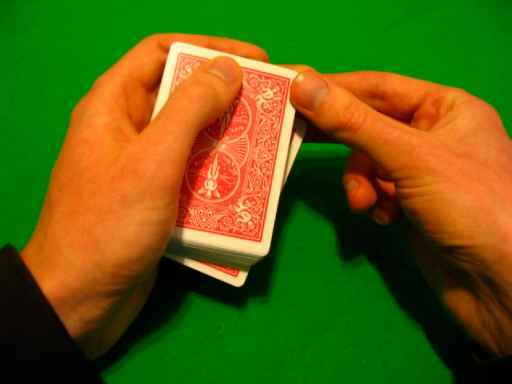 Finally, I find it helps a lot to twist the wrist in slightly as you deal off the bottom card and perform the pull back as it creates a superb retention of vision. Naturally, you need to ensure you pull your thumb back before performing the regular take when dealing tops in order to maintain consistency here. Ultimately, I don't like the illusion created in the bottom deal as much when you perform an angle push-off, but it is up to you, I do find the performing seconds is sometimes easier in this regard. This brings us back to the grip described earlier as the Erdnase grip, but with a twist, that I believe brings us to a more accurate version of the original. 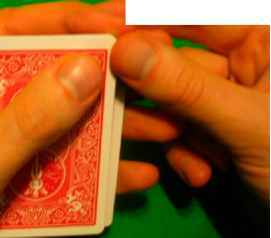 The deck is still held between the middle finger at the upper right corner of the deck and base of the thumb at the lower left and the forefinger maintains it's position, but this time instead of extending your ring finger and pinky they are curled under the deck. It is from this point that we begin, naturally you adapt your seconds and tops accordingly. Honestly, I find it very difficult to perform the bottoms with a side push-off, they're simply too unstable and so I'm merely going to describe the angle push-off technique, which is very deceptive. 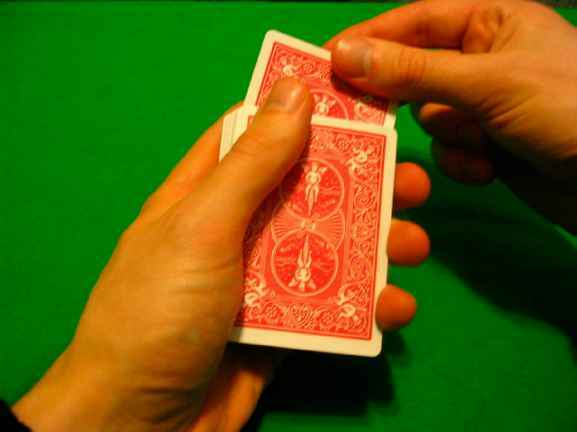 The basic deal has been covered numerous times, the thumb pivots the card over at an angle, and the right hand performs the take. 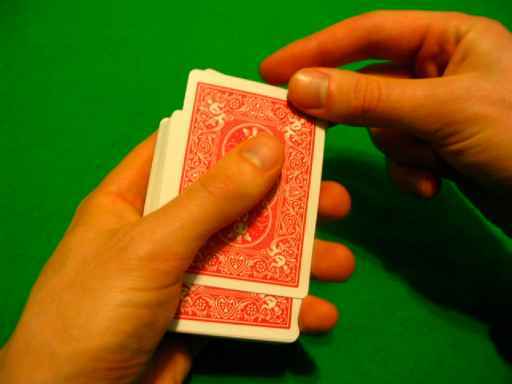 Now, obviously as you've surmised, we're going to push the bottom card out using the fingers under the bottom of the deck. Now you'll notice that it is virtually impossible to perform any significant push-out with the ring finger without creating obvious knuckle flash as such, you're going to do something that is difficult, but very deceptive. 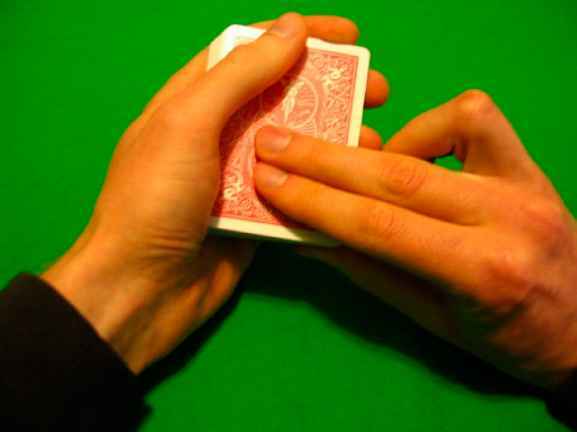 If there is a need to buckle the bottom card, do so with the ring finger as it shouldn't cause too much disturbance. However, you'll perform the push-off itself with the pinky. You'll notice if you try this that the curled ring finger provides a perfect shield to cover the actions of the pinky. There is one point I want to caution you on very strongly here, because I've seen a number of people make this simple mistake. When you take the bottom card from the deck, be sure you actually take it far enough out so it is completely free of the shadow of the deck. I've seen some clips on the internet where people will deal the card to themselves and they deal it off in such a manner that it couldn't possibly come from the top, it's dropping from the bottom. Simply because the dealer doesn't take it far enough away from the deck before dealing it down. Aside from this, the finer points of dealing from this grip have been addressed in other descriptions and so I'm sure collectively they provide ample information on dealing correctly and deceptively. The side strike bottom deal is really a strike bottom deal, but I felt it was necessary to create the illusion of a side strike bottom deal for those who wanted to perform side strike dealing and consequently all false deals in this manner. 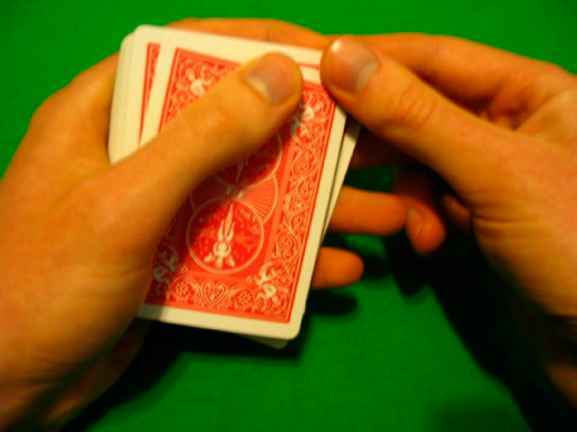 The concept involves starting in the mechanic's grip common to the side strike deal, with special attention to using the forefinger to hold the deck in place. In the process of apparently performing the side strike, you'll strike lower than normal so the tip of your right middle finger passes below the edge of the deck. 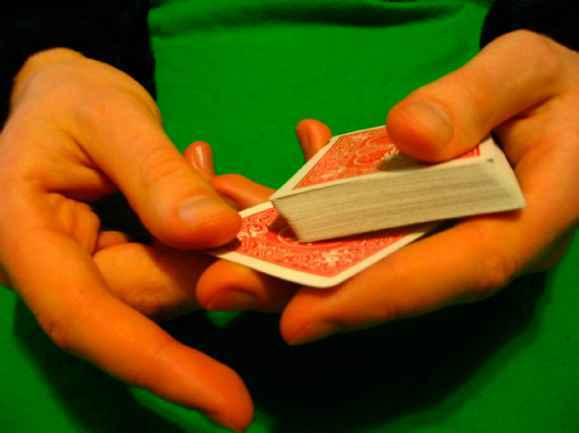 You'll lift the entire corner of the deck as though you're only lifting the top card and then in the strike motion of the thumb you'll push all the cards except the bottom one to the left, while taking the card out the side. Naturally, this will require moving the three last fingers of the left hand out of the way. The deal is less than ideal, but for a lay audience not paying too much attention it is functional. 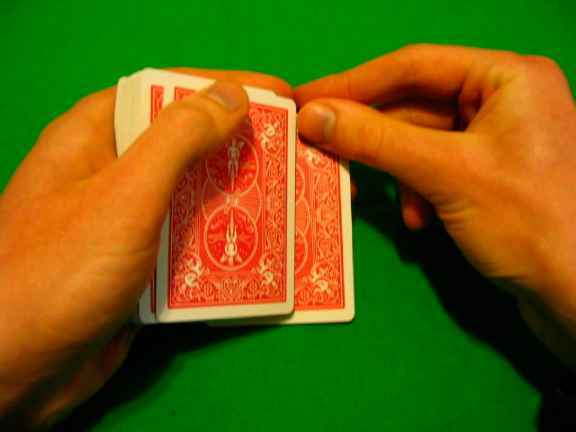 Alternatively, you could perform a slight push-off of the bottom card to make the take easier and potentially make for a more convincing deal. On reflection if you can do so effectively that is probably the way to go. 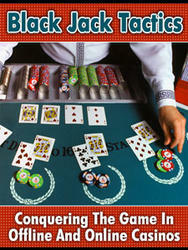 Stud bottoms are quite useful because stud poker is one of the most useful places for a bottom deal. Really, the deal has little to no application in the likes of Texas Hold'em where you can calculate from the beginning the positions of all the cards. On the other hand, in a game of stud poker players drop out and alter the order of the cards, making a bottom deal very practical. Naturally, this means a stud bottom is also advantageous. You could of course simply bottom deal the card and turn it over, but there's a certain elegance to performing a stud deal, it also makes the process somewhat more convincing. I'll give two methods and leave out the others as I consider many of the front turnovers to essentially be a forward take with turnover. Performed on the fly as a portion of a dealing sequence this method is very effective, assuming of course that you use it quickly and with grace. 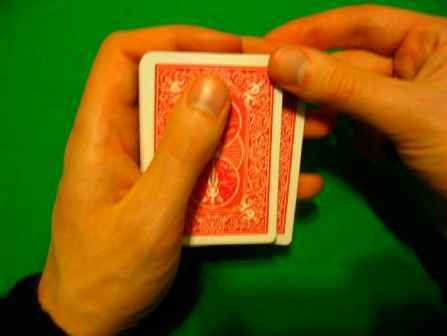 Now generally, there is a tendency for the cards to make a different sound when performing this action than when you perform a top. I find the sound is subtler and in order to eliminate that problem performing it fairly rapidly and focusing on enhancing the sound created by the bottom card as you perform the take is helpful. How to minimize finger flash of bottom deal?